A few days after reopening my Coral Forum, I was greeted by an email from a member who rightly pointed out to me that while he enjoyed my book Aquarium Corals, several corals that had become popular since its publication were not well-covered. He specifically mentioned Acanthastrea. I cringed a bit, but admitted he was right and promised an article on this genus of coral in the near future. In fact, mere days later I was visiting a local pet store in Houston where a six to eight inch colony of a rather ugly brownish-gray color had a $1000.00 price tag on it, and was labeled as Acanthastrea. Other smaller colonies were present, from a few polyps to small colonies that ranged from eighty to several hundred dollars in price. A quick perusal of live corals being sold on eBay (e.g., see here and here) and at mail-order vendors confirmed that many hundreds of dollars are being paid for specimens of these corals. I was and remain aghast! In this article, I discuss the biology and husbandry of Acanthastrea, in addition to providing some general ecological and trade-related commentary. Anthony, in turn, will focus more on the handling that occurs in the trade in this genus, including propagation and potentially illegal activities in the name of profit. At the IMAC 2005 conference, I learned that Eric was writing an article about Acanthastrea. Through that weekend's activities, we somehow struck upon the notion to co-author the piece. I hope my contribution will provide some information about how the aquarium industry handles the mussids we know and love as "Acans." I will discuss the farming and propagation of this coral, as well as a bit of a reality check on the actual handling of specimens from the exporting countries in an effort to add a perspective of true value to keeping these aquarium-suitable, sustainable and sometimes beautiful corals. The appeal of colored Acanthastrea, like many other mussids and numerous faviids, is quite understable with specimens like this. Photo courtesy of Amy Larsan (TippyToex). In a way I feel perhaps responsible for this recent fascination and concomitant exorbitant price of Acanthastrea in comparison with other corals. In this thread, I mentioned it was one of my favorite corals. In fact, if you search my forum, you will find that up until midway through last year, most people were asking for identifications of various mussids, some of which were Acanthastrea, and some which I could not identify. For an example, see this thread. These corals have historically been misidentified by hobbyists and merchants alike. They have been available for decades, often being sold as unobtrusive "meat corals" or "closed brain corals." Most sat for weeks or months in dealer tanks as another of the rather bland, massive corals that looked like all the other brain corals. No one really wanted them, and they sold for around $20-$30 at most stores, completely misidentified. They were as commonly available as many other genera of "closed brain" type corals; more so, in fact, than Platygyra, for example. Yet in merely a year, the hobby has suddenly bred a whole population of people who have become taxonomists of the genus, and who can look at these fleshy corals and affix a species name to them, much the same as they do with the genera Acropora and Montipora. It's no coincidence that such armchair taxonomists also are usually active traders or sellers: buyers beware. See my articles on coral identification here for such warnings. Ironically, consumers shelling out hundreds or thousands of dollars for these corals at pet stores don't even bother to bring a fifty-cent plastic ruler with them to measure a corallite to see if the identification is correct. Previous conferences have showcased brilliant displays of Montipora or Acropora. At this year's IMAC, there were displays proudly showcasing Acanthastrea. I asked one vendor if he wanted me to use it in a fragmentation demonstration, and the look I got in return was one that seemed to say it would be like cutting the Hope diamond into stones for a simple eternity band. This is not the first time such trends have occurred. Early in the reef hobby days, Xenia species were the corals of lore. To obtain or grow a specimen in this genus was akin to finding the Holy Grail. But unlike Acanthastrea, at least Xenia were legitimately uncommon ("rare" in the hobby) because of their dismal shipping realities from exporting countries. Now, they are considered a weedy species, and handfuls of them are given away at aquarium club meetings, and sometimes so many are produced they are simply thrown in the trash. Then came Acropora. Those who could obtain and grow Acropora were almost worshipped, and to some degree this reverence for the genus remains. Five-year waiting lists exist for tiny fragments of corals that are positively bland or for those that are among the most common species and color variants on reefs. Yet, like Xenia, Acropora are now considered a weedy, though still desirable, group. As an example of this phenomenon, about a year ago, I was honored to speak to the Los Angeles aquarium society, and was shown a member's tank. As I stared at the tank, the owner asked if I "saw anything special." I scrutinized the tank, feeling as though I were missing something. I looked left, and I looked right, and I looked in every nook and cranny in an instant, feeling like I was obviously obtuse in my observations of this tank. I was finally pointed toward a small fragment of an Acropora that was then explained to be one of the original and few remaining fragments of the famous "Steve Tyree Purple Monster." Without meaning offense, I must admit it wasn't terribly purple. In fact, I have some corals stuck in the back of my tank or lying on the sand with more color than this infamous specimen. I see corals with more color in most fish stores on a regular basis, yet this coral apparently commands a price of several hundred dollars for a centimeter or less. My impression is that a lot of people in this hobby have simply lost their minds! Other similar stories of "fad animals" abound: zoanthids, Ricordea, the Bangaii cardinalfish. 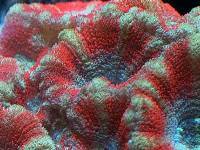 All have at various times been the newest trend for one reason or another, the corals suddenly commanding outrageous prices for a few polyps. In some cases, the truly rarest corals are unrecognized in stores, or command prices so low as to almost be given away. In other cases, the most common species and color morphs are treated as gold. The tragedy is that hobbyists fall into such traps and that many people make small fortunes from deception and trendiness. To elaborate on my comment about Acanthastrea being one of my favorite coral genera; it is one of my favorites because of the odd appearance many of its specimens have on reefs. These specimens are often surrounded by sediments and look like some random pieces of coral skin growing on the reef. It is not the rarity or color of specimens, but rather their oddity in nature where I have seen them, that is among the reasons that this genus is one of my favorites. I have lots of favorite corals, many of which would be passed by in most stores. I love Anacropora for its habitat and its delicate growth, yet some coral farmers actually give this coral away free with orders because it is just a rather boring brown shade. I also have what I believe to be one of the rarest corals in the trade; a species first described in only 1983, and virtually unknown until the publication of Soft Corals and Sea Fans (Fabricius and Alderslade 2001). It is a warty and rather ugly brown soft coral of the genus Dampia. Perhaps I could get a few hundred dollars for a cutting of this coral? Maybe I'll try eBay! To restate text I made for a ReefSlides here in Reefkeeping Magazine, Acanthastrea is a relatively large genus in the family Mussidae, and contains 12-15 species. With the exception of A. maxima, all of them may be found in the areas where coral collection for the aquarium trade occurs. 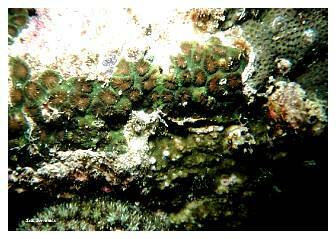 Acanthastrea species are not easy to distinguish from species in several other genera, and even families, of corals. They resemble other mussid corals, specifically Micromussa, Mussismilia, Symphyllia and Lobophyllia. They also resemble some of the many species in the family Faviidae that may be very difficult to tell apart. Recently, I also have seen Blastomussa wellsi being sold as Acanthastrea, and even Blastomussa have risen in price dramatically in recent months, perhaps because of their resemblance to Acanthastrea. Perhaps, and more hopefully, it is because Blastomussa are collected at levels that are questionably sustainable (Bruckner and Borneman, 2005). In general, the mussids are corals characterized by large corallites with large teeth or lobes on their septa. The corallites generally have well developed columellae. In terms of knowing if a living specimen is a mussid, it is possible to see or gently feel the septa for the presence of these large and often serrated-looking teeth. If they are not present, it is quite possible that it is a faviid and not a mussid. But, actual identification requires examination of a skeleton devoid of tissue, and most mussids and faviids are covered with heavy tissue that nearly completely obscures their skeletons' diagnostic features. If the coral is determined to be a mussid, species identification requires measuring its corallites across their diameter from wall to wall. 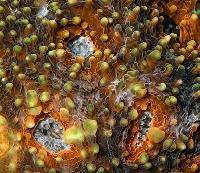 Micromussa, which looks very much like some species of Acanthastrea, has corallites 8mm or less in diameter. 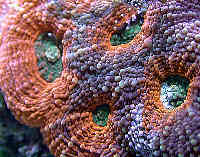 Acanthastrea generally has corallites smaller than Lobophyllia, and most have corallites between 8-15mm in diameter. Several species, though, may have larger corallites and these are the ones most difficult to distinguish from Lobophyllia and Symphyllia. With beautiful colors that positively overcome the often bland colors of Acanthastrea, other commmon mussids such as Symphyllia and Lobophyllia are seen here in a Palauan lagoon. 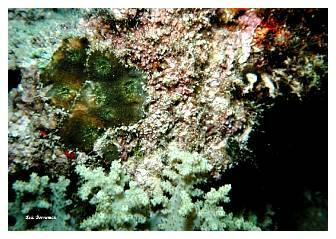 In the middle photo, there is an Acanthastrea visible. Can you find it? If not, how can you be sure that the photos on websites or the coral in the store is an Acanthastea, either? Photo by Eric Borneman. There is a reason for the above taxonomic distinctions. 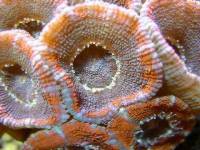 Many aquarists mistakenly assume they have Acanthastrea in their tanks. In fact, several of the photos in the ReefSlides presentation are questionable, and may be other species of other genera, including the faviid Caulastrea. The same is true of corals on the Internet and in stores being sold as Acanthastrea. Because these corals have very fleshy polyps, identification even to genus is difficult to impossible, as the characters that would confirm a positive identification are hidden. Even if Acanthastrea is the correct genus, assigning species to these living corals is very, very difficult, even with a bare skeleton. It should be assumed that any vendor selling an Acanthastrea with a species name attached to it probably hasn't the faintest idea if it is that species or not. A typical small colony of what I believe is Acanthastrea, photographed in Palau. Because I cannot see the skeleton, I am not absolutely sure this is Acanthastrea. With some exceptions, Acanthastrea are found in many locations on the reef, and although some species may be found much deeper, most are collected from shallow water to about 20m in depth. They are frequently found in somewhat protected locations or lagoons and may form colonies that are anywhere from a few polyps to large hemispheres to encrusting colonies several meters across, although not all species are likely to form such large colonies. Relative to other corals, they are similar in shape, color and habitat distribution to most of the mussids available in the trade, like the often staggeringly beautiful Lobophyllia hemprichii, a coral that commands a low price these days. Perhaps next year these will be worth thousands of dollars? In Corals of the World, Veron (2000) describes most species of Acanthastrea as relatively uncommon, though I would not characterize them as particularly uncommon in many of the coral collecting regions of Indonesia. Such a designation is also given to many species of Euphyllia, and while this may be true across their range, they are quite common in coral collecting areas (Bruckner and Borneman 2005). Ironically, Acanthastrea lordhowensis, termed in the hobby vernacular as "The Lord," is probably among the most common of the species. It is almost funny to see them described as "rare" by so many vendors - an obvious deception of the public to market the species at ridiculously inflated values. Skeletal features of Acanthastrea must be viewed to determine species. In this case, my Acanthastrea skeleton sat in my sump for a long time before I fished it out to add to my collection, and has been covered with coralline algae making identification difficult. I do not know what species it is, despite being able to see many of the skeletal features. Photos by Eric Borneman. In the aquarium, as is typical for most Mussidae, they are tolerant of diverse conditions and can thrive in strong or subdued lighting and water flow regimes. They are voracious predators with strong nocturnal feeding responses. Additionally, they appear very competitive in their ability to extrude mesenterial filaments in a coordinated manner, similar to Hydnophora (as is seen in the last photo of the ReefSlides slideshow). An aquarist on Reef Central has provided photos of this behavior in The Coral Forum that make her colony appear related to SpiderMan. Therefore, care should be exercised when placing these corals near other sessile organisms that are desired to remain undigested by aggressive Acanthastrea. I am pleased to see that aquarists are taking interest in species that were once considered uninteresting. However, the hyper-overinflated values of these corals are a travesty. For the price that a few colonies of Acanthastrea and "purple monster" nubbins are being sold at today, I could fly across the world on a long vacation to Sulawesi, dive the glorious reefs that I love so much in Indonesia, and with a little effort bring back Acanthastrea I collected using existing exporters. The only thing is, I probably wouldn't collect Acanthastrea. I usually just swim right by them. Let's play a game! Find the Acanthastrea in this photo. Regarding the issue of industry practices as it relates to the sale of "Acans," let me first address the response by a select few individuals to my "Reef Trendy" article. I was initially surprised to see a tiny outspoken and angry minority of aquarists yelping in dissent, yet it soon became very clear why the emotions flowed. We (hobbyists) will kill our cash cow if we wake up and collectively realize what's going on. The complaints were from a small group of active "collectors" who buy, trade and sell "Acans." These individuals are largely working in collusion with each other literally to the extent of price fixing, if you can believe the number of aquarists we have heard from who discovered or keenly suspected such activity and made it known to others in the industry and law enforcement. The matter has been exacerbated by some poached (pers. comm. 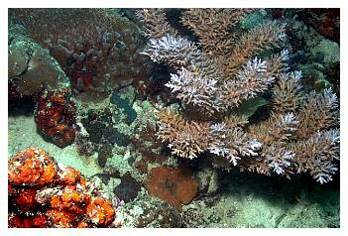 US Fish and Wildlife) corals making their way into the US trade. Price fixing is when several competitive businesses conspire to reach a secret agreement to set prices for their products in order to prevent real competition and restrain the public from benefiting from price competition. Price fixing is a criminal violation of federal antitrust statutes and also includes secretly setting favorable prices among suppliers and manufacturers or distributors to beat the competition. So why did the "Acan" traders bark at my article and other hobbyists' similar posts? The Ricordea collectors did not peep, nor did the Acropora or Montipora enthusiasts. The irony was that my article barely mentioned "Acans"
certainly not more than the other corals listed, or the top-shelf skimmers in the same discussion. I think it has mostly to do with the profit-driven and dubious marketing tactics, which may include acts of collusion or secretly shilling each other's sale/trade posts. Which leads us to the crux of my concern that some readers have failed to understand in my opinions on the "responsible" trade in corals. Let me first state that I have paid hundreds of dollars for individual corals and fishes through the years, and if I could afford it - I might buy specimens that cost thousands of dollars. Secondly, I have no problem with buyers setting a market price (any price) based on honest information and offerings! Indeed, hand-made Italian sports cars command a higher price for two very good reasons: value and limited production. And in turn, makers of mass produced family sedans also earn their profits for the very same reason: value. Based on the facts and merits of a good or service, we each can fairly and individually (often over a very wide range!) determine what we consider "valuable" to us. But that is not what we have here in some of the trendy coral frenzies. Instead, nefarious merchants are calling corals rare that are not rare (more about this below), or offering poached specimens. It's not honest. It's not responsible. And it's not legal. they won't sell it?" Yes, but again this is not an issue about forcing a drop in the price of beautiful and expensive corals by consumer holdouts just because we want to possess them. Indeed, we cannot all collectively lower the price of those Italian sports cars simply by not buying them and waiting for the price to fall. And we cannot do the same for truly supply-limited corals either. I am simply concerned about fraudulent sales at any price, however harmless the misinformation may seem, as with ignorant merchants that have never worked as an importer or even been on a reef who are suddenly qualified to call something "rare" in the hobby or the wild. that's odd. What does "not Indo" really mean? It begs the questions of where they came from, and why not tell us? If it was simply some other legal exporting country, then why not say so? Or is there some not-so-coincidental correlation to the formerly touted Japanese Acanthastrea that "disappeared" when the rumor got around that law enforcement was looking for poachers? Apparently, a number of corals were illegally exported from Japan under other names (Favites chinensis and Goniatsrea pectinata) that were indeed Acanthastrea. Because of the huge sums of money involved in this confiscated collection and continued plans to continue the illegal profit-making venture, investigations are currently underway (Borneman pers. comms). It seems the conspiracy now extends back to the countries of origin where some traders are getting quite rich while collectors still get a few pennies for collecting the same "closed brain corals" they always have been collecting. Not surprisingly, poachers have continued to bring in shipments of illegally obtained specimens under such guises as Blastomussa. The smuggled corals are so profitable that it is worth using couriers to carry small quantities from Japan among personal belongings! So the marketing game has now changed, and some of those "Acans" labeled as "not-Indo" do look remarkably similar to those Japanese "Acans" offered previously. Again, it does beg the question. By looking at the range of many Acanthastrea species and the countries with coral exporting permits, we can see that the range is predominantly Indonesia. These species can and do exist in other areas, but we must ask ourselves, "Is coral collection and trade allowed from those countries?" 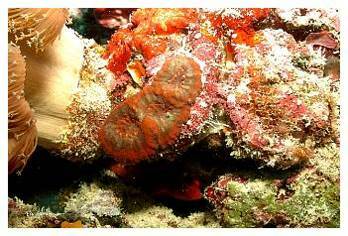 If not, then the only Acanthastrea that should be sold are legal ("Indo") Acanthastrea." Looking at the CITES regulations, the legal range of collection is clear. And when the office for the Ministry of Trade in Japan says that Japanese coral exports for ornamental sale are illegal (Calfo pers.comms), then that's also good enough for me. To conscientious aquarists, I ask if it is really worth it? Why break the law that is designed to protect the species and reefs that we admire which are under pressure? What we are hoping, of course, is that informed, conscientious aquarists will not support poachers, scammers or price gouging. And surely the most tempted individuals can easily console themselves with the fact that so many other, legal, aquarium suitable species are available to more than satisfy their desire to keep and observe beautiful reef corals. Yet, still I lament the creation of (unworthy) hype for so-called rare corals. It is much like the multi-year waiting lists for species from some merchants, as Eric mentioned above. Such lists are laughable to the point of incontinence. They illustrate, at best, the grower's ignorance of true coral farming harvest cycles, as well as best-case production possibilities. At worst, such lists betray some sellers' more nefarious side. Do consider, however, that as a grower of "rare" corals, if your goal is either to make the most money possible, or to give away the most frags possible, doesn't it make more sense to delay trades temporarily and build a bigger fragment inventory from which to distribute them? Why wouldn't a grower want to turn one frag into two, two into four, four into eight and so on until the fragmented colony reaches many hundreds or even thousands of clones in a year or so (see my comments on the ease of fragmenting "Acans" and their speed of growth)? What is the logic behind merely scavenging two of four brood stock pieces each month? This cannot even compare to the mass production of a brood colony of even just 500 fragments that affords the harvest of 50 pieces monthly, or more. It should be apparent that a hearty production and productivity at harvest would kill the long-term waiting lists in the most delightful way for everyone involved. go to CITES.org (here and here) and see the export quotas for yourself. Review Indonesia, for example, and look over this year and back at the last several years reported. You will be dumbstruck to see how many Acanthastrea were sent out relative to many other (correctly perceived as) common corals! And you will also notice the absence of quotas for stony corals from Australia, Japan, USA and other such countries that ban or restrict the collection of their stony corals for export. If you also read the details of the quotas, you will see that for many entries listed, there are actually more than a few different species of the same genus that can be lawfully exported under that given type species. This is a practical and appropriate accommodation for collectors and wildlife agents who largely, like ourselves, cannot readily distinguish species between various Acanthastrea species, for example, based on living examples of stressed and retracted corals in shipment containers. And so, this is why some import lists only have "Acanthastrea echinata" listed, but other species are still exported legally under the same name. This is also one of the tricks that bogus sellers use to drive up their prices. Ignorant customers see only "A. echinata" available online, wholesale, or from their local retailer's lists, but the "savvy" seller is promoting his possession of a "rare" species. Consequently, when we tell you that the genus is not that uncommon in supply from legal exporting countries, we really aren't kidding! And it has always been that way. For example, I just got back from a trip to the South Pacific to consult on a coral farm startup. Visiting with the divers on the very first day, it was not surprising or impressive to see them collect boxes upon boxes of beautiful Acanthastrea. Not surprising, in part, because they also brought up similar numbers of Faviids, Euphylliids, Pocilloporids, etc. And because of the common abundance and availability of these popular corals, it should not surprise you that they all were priced the same upon export! Yes, the gorgeous "Acans" sold to L.A. importers for exactly the same price as brown Favia brain corals, pink Stylophora, common Fungia discs and everything else in the lot. This is very much how the early supply side of the chain works: reliable, consistent, high volume and relatively low profit commodities. This happens week after week from the exporting countries and has been going on for decades. The typical appearance of Acanthastrea on reefs in collection areas of Indonesia. Small isolated colonies of a few polyps, unobtrusively forming a skin-like covering over the substrate. One can imagine the amount of hammer-and-chiseling of the reef it takes to obtain such specimens. Photos by Eric Borneman. Just a month ago I was in Singapore, and the story was the same. I spent many hours and days visiting local fish stores, coral farms and wholesalers. Acanthastrea were equally as common and plentiful as elsewhere. I saw hundreds upon hundreds of specimens, and all for the average price of any other coral, just like it used to be here in the USA not too long ago. The topic of trendy corals is not my principal or even significant interest in the aquarium hobby. Far from it, although straight talking is. But the issue really has reached a crescendo beyond anything I can fathom. I just checked the big online auction site, eBay, for a random search of "Acanthastrea" and the first item that came up (bidding to end July 30, 2005) happened to be a 600+ polyp colony of 20+ pieces of these beloved Mussids; the seller values his collection at over $75,000 and has offered it for "only" $17,500. For such corals that enter the US for less than $10 each, I have to ask at what point in the jump between $200 and $17,500 is it considered lunacy? well, anticlimactic! But at last, in this article, I am granted relief from a fetal position where I've been laying for hours and chanting "find a happy place, find a happy place!" A safe, fun topic without controversy! Acanthastrea is categorically one of the hardiest, most tolerant and fastest growing stony corals I have ever worked with. And mind you, I have worked with hundreds of coral species, and handled many, many thousands of specimens through the years. For anyone interested in keeping and/or propagating Acanthastrea, you have my strong assurance that it is a delightfully forgiving and aquarium-suitable genus to work with. · Large polyps that feed heartily and can be target fed organismally (use minced meats of marine origin: zooplankton substitutes). Note: frequent feeding accelerates growth, recovery and the harvest cycle. · Distinct and conspicuous corallites that are easily separable with minimal collateral damage to the rest of the colony. · Adaptability over a wide range of lighting conditions, but especially tolerant of the heavy blue/cool temperature spectrums that aquarists commonly favor for aesthetics. · Fast growth and popularity among aquarists translates to good profits and appeal to commercial farmers/sales. Starting with judiciously cautious fragging techniques of this coral, I have since learned an appreciation through the years of how very tolerant this genus is to handling. Presuming a propagation candidate is ideally well-established (six months or more in the latest place of residence) and well-conditioned (regular feedings, stable mineral composition and quality of the water), success is almost assured in your endeavors to propagate it! Without imposing any significant change in lighting or water flow "post-operation," the fragmented donor and taken divisions will heal remarkably fast. I have watched mine and others' heal in days and grow out to be fully formed polyps ready for bilateral division again in as little as two to three weeks. A one-month cycle of harvest is, in fact, conservative when you start with well-established specimens. do not fear! Acanthastrea is remarkably resilient. As you can see in the images, I now resort to brutally chopping individual polyps in half with a razor blade or scissors. 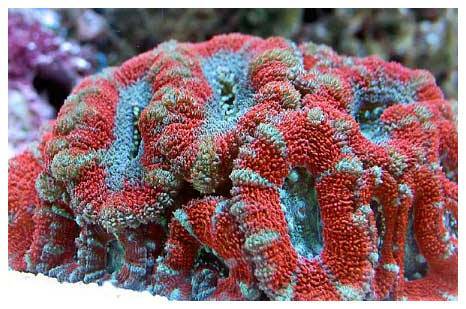 Polyps of this fabulous coral heal and grow out in less than one month. Strong water flow and frequent feedings are crucial for a fast harvest cycle, though. Polyps can even be kept on the sand bottom as free-living specimens. After a few "generations" of fragging divisions, there is less/little carbonate mass underneath each polyp; they are simply fast and loose on the "seafloor" or your propagation tank. It is indeed remarkable to see and feel the crushing of septa as a blade passes through a polyp. Cuts can safely be made anywhere through the colony and between the polyps. And please be reminded that the successful propagation of each/any such corals is a result of the demand for similar reproduction from the wild. Acanthastrea is indeed a very hardy and useful aquarium coral, even if/when its color is unremarkable. Just remember to use these, and all, corals responsibly. It would be nice if the profits being reaped from the recent sales of Acanthastrea stayed in the hands of the resource countries, and not in those currently engaged in their trade at tremendously inflated values. The hype could encourage smuggling and other black market trades solely for the expectation of great profits. For example, countries without permits for the export of corals may begin to exploit their protected resources, which otherwise may have been left undisturbed, for the lure of the thousand dollar corals off their shores. We have indeed heard of collectors in non-CITES countries scheming to send their corals to CITES island nations for rerouting to America. There sadly can be no mistake about the impetus and responsibility for such unlawful responses. We drive many markets, and this is not something to be proud of. Perhaps all corals collected from the wild, without real evidence to ensure that they exist at sustainable levels for continued collection, should command exorbitant prices. As coral reefs continue to decline, there should be real economic pressures on the sale of CITES-listed species, but not like those described in this article. Perhaps it's time for wild collected corals to be taxed so that the tax levied goes into reef conservation efforts and organizations. This type of action would encourage mariculture, aquaculture and sustainable harvest practices. It would also go a long way toward the long-established CITES provision that trade in CITES species REQUIRES a non-detriment finding, by a scientific authority, that trade in the species does not occur to the detriment of the species' survival. In the case of the coral trade, particularly those from the major exporting nations, this is little more than an empty statement since rigorous population studies have not been conducted in most cases. If vendors and buyers are interested in a coral because it is rare, or the claim is made that it is rare, then there should be a reduced demand by aquarists for the species. The mission statements of all marine aquarium societies I am aware of include language about stewardship, conservation and sustainability. It is no longer considered fashionable to have ashtrays made of gorilla hands or umbrella stands made of elephant feet. The trade of ivory is also banned in many nations. Why would vendors who purchase booths and the aquarists who attend international aquarium conferences, who themselves are almost invariably conservationists, not be outraged at the sale of a "rare" CITES-listed species, rather than desiring it or offering it for sale? If indeed the species is truly not rare, then such sales are based on lies, at best and fraud, at worst. Price fixing of these (or any) desired coral is also a crime. Acanthastrea may be rare in some areas and more common in others. Some species might be rare, in general. There is little evidence, however, that they are any more or less rare than the many thousands of other corals already in the trade. It is always exciting when something happens to create enthusiasm in the reefkeeping community; we hope, however, that such excitement is based on new advances and knowledge, not the over inflated and hyped demand for this year's wild collected "coral du jour." If you have any questions about this article, please visit either Anthony's forum or Eric's forum here on Reef Central. Bruckner AW, and Borneman EH. 2005. Developing a sustainable harvest regime for Indonesias stony coral fishery with application to other coral exporting countries. Proc 10th Int Coral Reef Symp, Okinawa. in press. Fabricius, K. and Alderslade, P. 2001. Soft Corals and Sea Fans. AIMS, Townsville. 264 pp. Veron, J.E.N. 2000. Corals of the World. Australian Institute of Marine Science, Townsville. 3 Volumes.